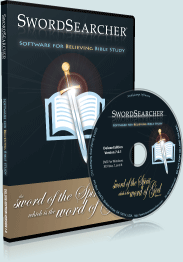 A classic Puritan whole-Bible, verse-by-verse style commentary. 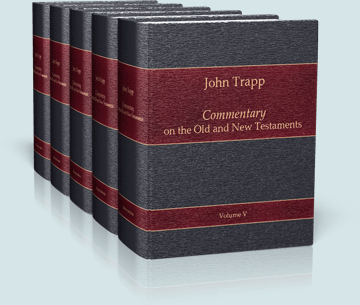 John Trapp's commentary is noted for its quotability, brimming with short illustrative sayings that are just as relevant today as the day they were written. The five volumes were originally published together in 1662. "Would it be possible to eulogise too much the incomparably sententious and suggestive folios of JOHN TRAPP? ... Trapp will be most valuable to men of discernment, to thoughtful men, to men who only want a start in a line of thought, and are then able to run alone. Trapp excels in witty stories on the one hand, and learned allusions on the other. ... His writings remind me of himself: he was a pastor, hence his holy practical remarks; he was the head of a public school, and everywhere we see his profound scholarship; he was for some time amid the guns and drums of a parliamentary garrison, and he gossips and tells queer anecdotes like a man used to a soldier's life; yet withal, he comments as if he had been nothing else but a commentator all his days. ... he who shall excel Trapp had need rise very early in the morning. Trapp is my especial companion and treasure; I can read him when I am too weary for anything else. Trapp is salt, pepper, mustard, vinegar, and all the other condiments. Put him on the table when you study, and when you have your dish ready, use him by way of spicing the whole thing. Yes, gentlemen, read Trapp certainly, and if you catch the infection of his consecrated humour, so much the better for your hearers."